Look at these lovely gifts from my exchange partner, Katherine, for the craftaholics anonymous gift exchange. I love the scarf she made! And with the weather here at the moment I need it! And the crochet flowers have really brightened up my bag. I just love the gift exchanges! It is so nice to see what other creative things people make! 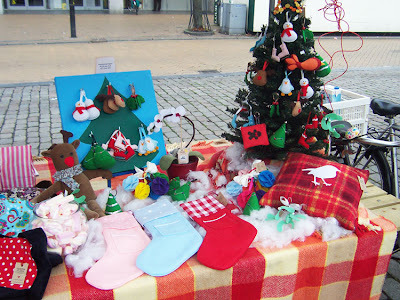 This entry was posted in Gift Exchange on December 7, 2011 by Handmade Cuddles. This month I took part in the handmade gift exchange over at craftaholics anonymous. I love taking part in her gift exchanges, it is so fun to meet you gifting partner and think up what you want to make for them! This time I was partnered up with Katherine from Ireland. I sent her an email about myself and think I like and got one back too. Reading through her email nothing jumped to mind to make so it took me awhile to get started but in the end this is what I made her. I have to admit I took the basic peacock design from a postcard I have and made it all bright colours instead of the postcards teal and purple, and I also changed the tear drop shapes to circles because I wanted buttons, and round buttons looked stupid on tear drop shaped felt pieces, but if I wasn’t adding buttons I think I would have stuck with tear drops. The tote is made of a sandy velvety feeling fabric, and the peacock is made from felt circles with buttons sewn on. I used a light blue cotton for the lining. It is a pretty big bag so you can keep lots in it, and my partner also likes to knit so I thought if she doesn’t use it as a handbag, she could use it to keep wool and stuff in! To make it, I first cut out my tote pieces. I cut two pieces 35cm by 50cm and two the same size from the lining and interfacing, and then 2 pieces 10cm by 50cm for the handles. Then I cut out all the different sizes of felt circles, I did it freehand (because I was too lazy to draw around things). I then sketched on a piece of paper the design and used that to mark points on the bag to sew the lines. Once I did all the lines I sewed on the peacocks body, and the circles above her head. Then I machine sewed on each of the other circles, using my sketch as a guide on where I needed them to go. Once they were on I sewed on each button. Because my fabric was medium weight I added a layer of interfacing, but if you are smarter than me you do this before you sew on all the buttons, it is not easy to iron on top of buttons!! Once that was done I constructed the bag like a general tote, adding 8cm box corners to it. If you have never made a tote before here are some great tutorials for it. I also included some small extra gifts in with my package, some buttons, little felt purse and some Christmas decorations. 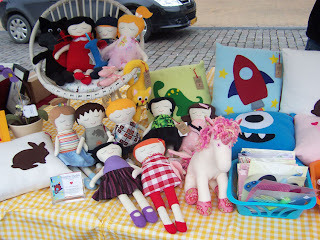 This entry was posted in Gift Exchange on November 30, 2011 by Handmade Cuddles. 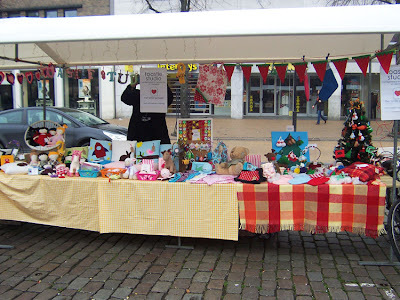 Yesterday I had a stall at the Diezijn Leuk craft fair in Groningen. We had great weather, no snow or rain, was cold but not too bad. 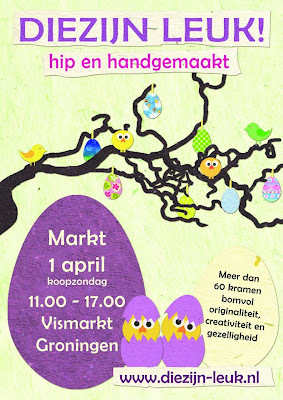 It was lovely meeting all the people, and I really could see how much I have improved in speaking Dutch compared to my last craft fair when I needed my boyfriend to help a lot more with customers. We got to the fair at 9am, and as we don’t have a car we carried everything on our bicycles! I carried 3 laundry sized bags on my handle bars, and a crate on the back of my bike, and Tomas carried one big laundry bags and a duffel bag. Took just over an hour to set up and then we sat and waited for the fair to begin at 11am. As the day went on we had lots of visitors and so many nice comments about my products, every sale made me happy and made it worth while standing outside in the cold all day. I have a couple of custom orders from the day too which I am working on today to ship out by Wednesday. 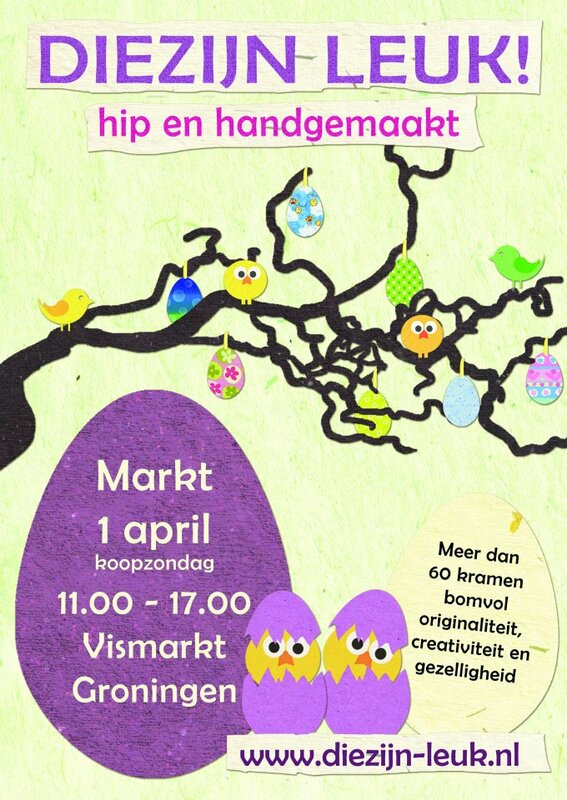 I also have a Dutch exam on Wednesday so this week will be just as busy I am sure. 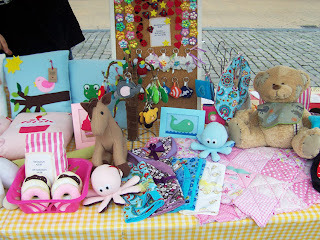 This entry was posted in Craft Fair on November 7, 2011 by Handmade Cuddles.